Regina Rudd Merrick’s childhood love of fiction set the stage for her career as a librarian. 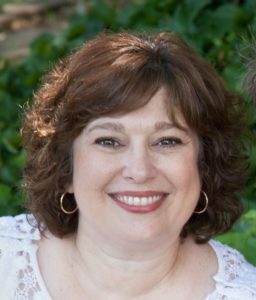 She eventually began attending local writing workshops and honing her craft, which led to attending her first ACFW Conference. Regina is now an active member of the Ken-Ten Writing Group and is currently helping to plan their third writing conference, scheduled for June of 2019. Her first novel, Carolina Dream, book one of the “Southern Breeze” series, was released in April 2017. Book two, Carolina Mercy, released this summer, and book three, Carolina Grace, will release in February of next year. Regina and her husband, Todd, have two grown daughters and live in Marion, Kentucky. I’ve been writing all my life. It came easy to me, but I never started writing actual stories until I found online “fan-fiction.” I began writing stories about the characters in a television show, “Sue Thomas: FBEye,” based on the true story of a deaf woman who became an FBI analyst. After writing several novel-length stories, I found a group of people who were using this forum as practice for publication. From this, I attended my first ACFW conference, joined a writing group, and attended writing workshops through my local library, of which I was director at the time. The rest is history! The Author and Creator of our lives often writes in a twist that ultimately blesses us more than our original plan. Have you ever experienced such a “Divine Detour”? Most definitely. During the time when I began writing, my husband was in a very high-pressure job, my kids were busy with their own school activities, and I was bored, so I started writing! At one point, I gave up. It was getting hard, and I had too many distractions. When I went to my second ACFW Conference, I realized that I just didn’t want to do it – but then I realized that I was physically not well. Once I got my body back on track, the writing bug hit again, and I started attending my writing group and was published within two years. God had to slow me down and get me to the point of giving it up in order for me to have something to write about! Now I write about second chances, and about what happens when we neglect our spiritual life! Let’s talk about your new book, Carolina Mercy (Mantle Rock Publishing, July 2018). Please tell us about it. 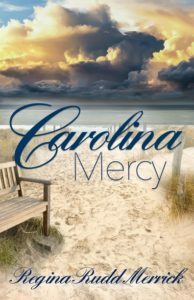 Carolina Mercy is book two of the Southern Breeze Series, and picks up several months after book one, Carolina Dream. Introduced in book one, Lucy Dixon and Tom Livingston had felt a spark when they met in South Carolina, double-dating with their best friends, Sarah and Jared (the main characters of book one). When tragedy strikes, they are reunited, but Lucy is not happy with Tom, because he never contacted her once she went back home to Kentucky. A born organizer, and just a little spoiled, Lucy has to decide whether or not to give Tom a second chance, and Tom has to decide whether or not to put himself out there because he doesn’t think he has time for a relationship. When a hurricane strikes and a friend is critically injured, they have to join forces. Will a tragedy bring about a blessing for them both? God had to slow me down and get me to the point of giving it up in order for me to have something to write about! After writing Carolina Dream, I wanted to finish Jared and Sarah’s story, but I also wanted to write Lucy and Tom. They were such great characters in the first book, and totally deserved their own story! So, since Lucy and Sarah are best friends, and Tom and Jared are best friends, it just seemed right to pull in both storylines! Ugh. I’m on a diet (I have a daughter getting married next year! ), so right now I’m low-carb. I guess for now a cup of peppermint tea with a half a packet of Stevia! LOL! In the old days it would have been M&M’s! I’m the girl next door. I’ve always felt out of place – like most people – and I never feel like I’m deserving or desiring of the center of attention! What’s your favorite holiday tradition or memory? My favorite holiday tradition started when we moved 60 miles from our hometown, and my parents soon after. We go to my mother-in-law’s on Dec. 23, and my mother’s for lunch on the 25th, so we have our family Christmas on Christmas Eve. The part that is my favorite is Christmas morning – we have both sets of parents come for breakfast. It’s been a blessing. My in-laws have nothing going on for Christmas Day, usually, and my mom and dad appreciate getting to visit with my in-laws, who are good friends of theirs. It started as a way for the grandparents to see what the kids got for Christmas, but now it’s more about the visiting! That’s a beautiful tradition, Regina! Which best describes your perfect Christmas tree: a lush blue spruce decorated with the latest couture; a shaggy cedar covered in homemade ornaments and strung with popcorn; a vintage aluminum tree with shiny glass bulbs; or a palm tree adorned with pink flamingos? Ooooo . . . . a palm tree would be amazing WHEN I move to the beach (hehe) . . . But even if I lived on the beach, I’d probably have a shaggy cedar with homemade ornaments and strings of popcorn! Every year, I want to throw it all away and get new stuff, and guess what? I go through all those ornaments and decorations, some of them that were handmade by relatives or my kids, or me, and I can’t do it. It’s a sentimental time of year, and it always reminds me how much God has blessed us! Thanks, Regina! It’s nice to have you as a guest at Divine Detour. For more information about Regina, visit her website and/or on Facebook or Twitter.